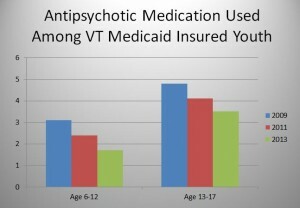 Newly analyzed data from the Department of Vermont Health Access is revealing important trends regarding psychiatric medication use in Vermont children and adolescents. The data examines Medicaid insured youth who took at least one medication in various classes (antidepressants, ADHD medications, antipsychotics, etc.) over the course of the year, comparing rates between 2009, 2011, and 2013. Efforts were made to ensure that children were counted only if the medication was used for psychiatric conditions rather than other causes such as seizures or allergies. Separate statistics were computed for children within the foster care system. One of the highlights is a decrease in the use of antipsychotics among youth. Among 6-12 year olds, the rate dropped from 3.1% in 2011 to 1.7% in 2013, a 45% drop. For adolescents, the rate went from 4.8% in 2009 to 3.5% in 2013. Among foster care children aged 6-12, the rate drop was even more dramatic (17.2% in 2009 to 7.2% in 2013). Antidepressant rates were relatively flat, while ADHD medications increased somewhat. For example, the percentage of adolescents aged 13-17 taking ADHD medications such as stimulants increased from 12.10% in 2009 to 14.1% in 2013, while for younger children (6-12 years old) the rate was pretty stable (13.0% in 2009 to 13.4% in 2013). These data continue to support the conclusion that the pattern of psychiatric medication usage in Vermont youth is different than most parts of the country. While it is unclear what is responsible for these trends, many efforts have been launched across the state by individuals here at the Vermont Center for Children, Youth, and Families and elsewhere to try an ensure that medications are used carefully and only as a component of a more comprehensive treatment plan that includes many health promotion strategies. This entry was posted on Monday, April 28th, 2014 at 9:55 am and is filed under ADHD, Medications, Psychosis. You can follow any responses to this entry through the RSS 2.0 feed. You can leave a response, or trackback from your own site.